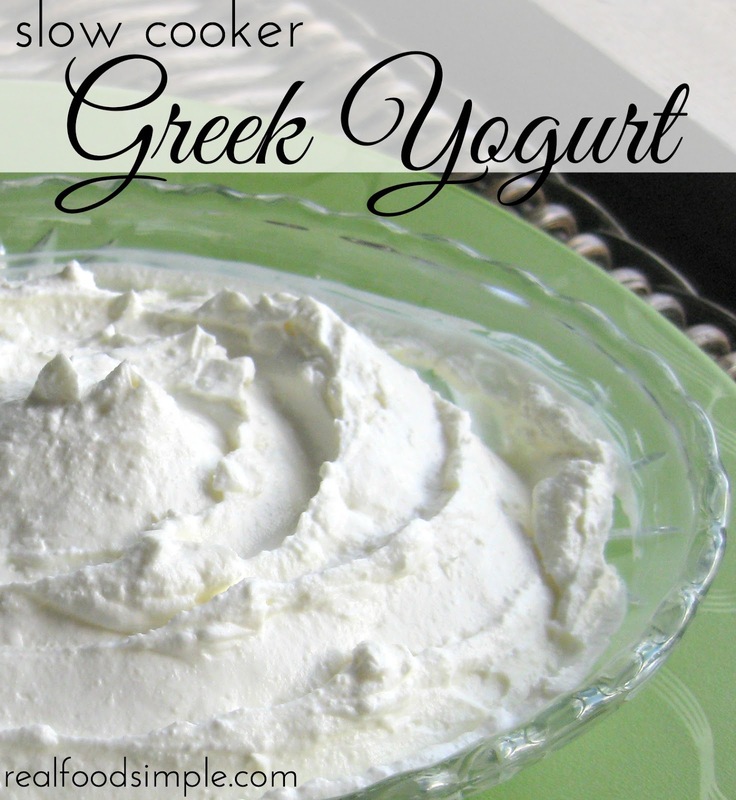 This is a simple way to make yogurt at home in your slow cooker. And if you like the thick, Greek-style yogurt, you can easily get that consistency with an extra step. Making yogurt at home also ensures that you control the ingredients. Store-bought yogurt usually contains a lot of added sugar. And unfortunately, it is getting harder and harder to find plain yogurt. This recipe is so easy, it will be your go-to recipe for making yogurt at home. Place milk in slow cooker on high. Heat until temperature reaches 180 degrees. For me this usually takes 3-4 hours, although some websites I have seen say it only takes them an 1.5 to 2 hours. Once it reaches 180, turn off your slow cooker and let the milk cool to 115 degrees - about 1 hour. Take 1 cup of the warm milk and mix it with the plain yogurt. Add it back in to the slow cooker and stir. Place lid back on slow cooker, wrap the entire cooker in a beach towel (or thick bath towel) and stick in a semi warm place overnight - 8-12 hours. I put mine in my oven with the light on. In the morning, take out the crock pot, unwrap the towel, take off the lid, and...yogurt! That's it, actually. At this stage it is runny, but it is still yogurt. If you would like it thick like "Greek" yogurt, or the less fancy term "strained," you can drain the excess whey from the yogurt. I have tried this two different ways and I like the second way better. This second option seems to hold more and strain better. The drained whey is much clearer with the second option, which tells me less yogurt seeped through. * Drain anywhere from 4-12 hours. If I am lazy (which I often am) I will put it in the fridge all day or even overnight. The longer the draining, the thicker the yogurt. When you leave it for that long, you really end up with more of a yogurt cream cheese. Perfect to mix with some whipped chocolate peanut butter for a pseudo- cheesecake dessert.